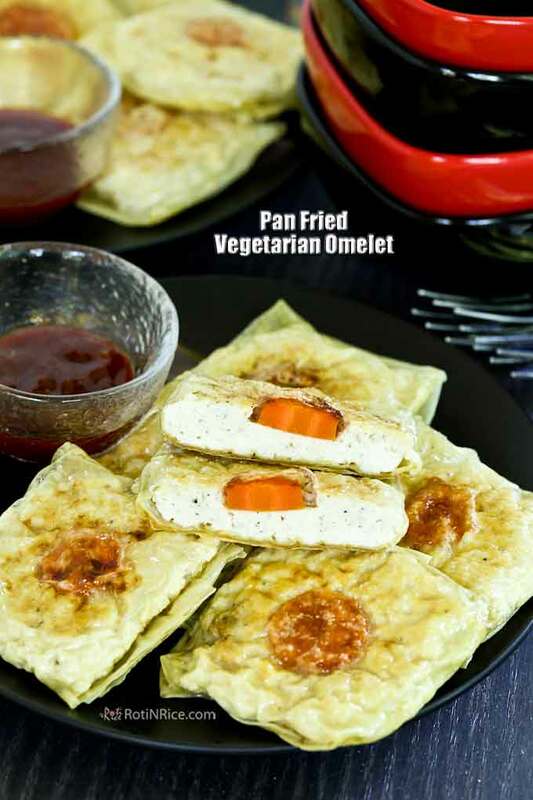 Light and tasty Pan Fried Vegetarian Omelet made with tofu, carrots, and beancurd sheets. Can be served as an appetizer, snack, or side dish. Vegetarian dishes and mock meats are popular in Chinese cuisine. People of Taoist or Buddhist beliefs do observe vegetarianism during certain times of the month. Others partake of it simply because these dishes can be very tasty and quite delicious. That said, many Chinese families whether practicing vegetarians or not often have a few vegetarian dishes in their cooking repertoire. These are not your regular vegetable stir fries. They usually consist of tofu and its derivatives as the main ingredient. 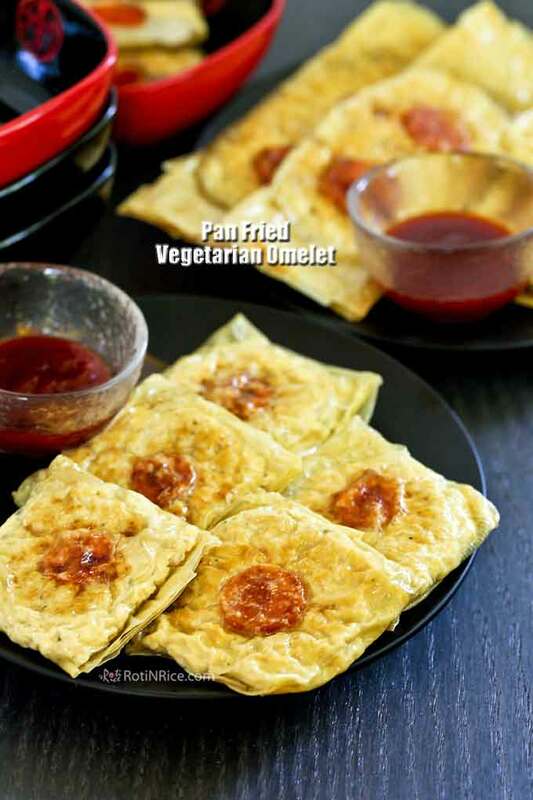 Today’s Pan Fried Vegetarian Omelet recipe came from my mother-in-law. I have never seen or eaten this dish personally cooked by her but I thought it was a brilliant idea to use carrot to simulate egg yolk and tofu to simulate egg white. Through Ro-Ri San’s description, I was able to recreate these tasty bites recently when I managed to buy a package of more or less intact “fresh” beancurd sheets. Actually, they came frozen and this makes them susceptible to breaking into small bits which will not work. I believe my mother-in-law made only single yolk omelet packages. I thought it would be fun to make double yolks packages and so I made a few rectangular packages with two pieces of carrots. The single yolk packages are harder to shape but easier to handle when cooked. The double yolks packages are easier to shape but are not as compact. Cut bean curd sheets into squares of 6 inches x 6 inches. 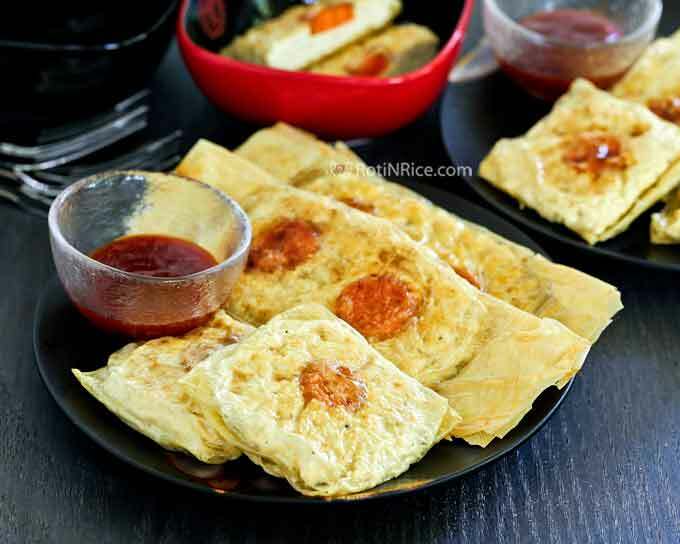 You will need 8 beancurd squares for omelet with double egg yolks or 16 squares for omelet with single yolk. Remove tofu from packaging. Place in a deep dish and weigh it down with another flat base dish for 30 minutes to remove excess liquid. Pour away the liquid and transfer tofu to a medium bowl. Mashed tofu with a potato masher. Add salt and ground pepper. Mix well. Place a prepared piece of beancurd sheet on a clean work surface. Moistened slightly with a damp towel to soften. Place 1 piece of carrot in the middle of the bean curd sheet. Pile 1 tablespoon of mashed tofu on top of carrots. Shape mashed tofu into a square. Fold the bottom and top portions of beancurd sheet over the mashed tofu. Then fold the right and left sides on top of each other to form a square. Transfer onto a plate seam side down. Repeat until all beancurd squares and mashed tofu are used up. Place 2 pieces of carrots in the middle of the bean curd sheet. Pile 2 tablespoons of mashed tofu on top of carrots. Shape mashed tofu into a rectangle. 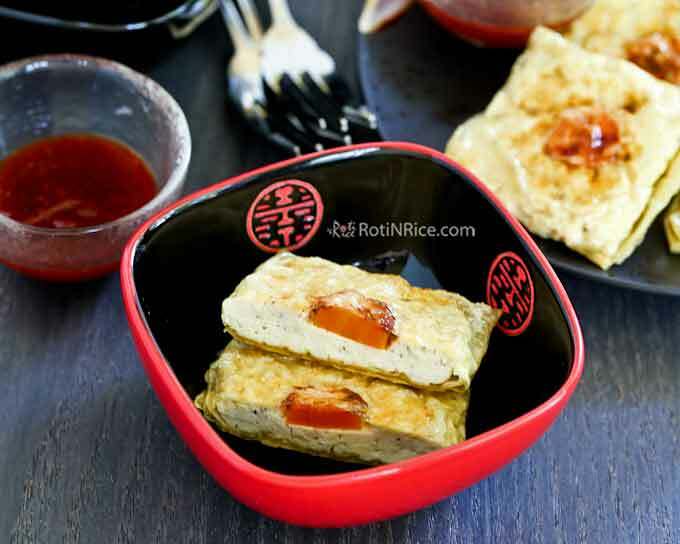 Fold the bottom and top portions of beancurd sheet over the mashed tofu to form a rectangle. Transfer onto a plate seam side down. Repeat until all beancurd squares and mashed tofu are used up. Heat vegetable oil in a large non-stick fry pan. Place prepared tofu packages seam side down onto fry pan. Allow them to pan fry for 4 to 5 minutes. Flip tofu packages over and continue to pan fry for another 4 to 5 minutes. You may have to pan fry tofu packages in two batches. Serve warm with sweet chili sauce. These look like fun as well as looking quite tasty. Thanks for sharing Linda!